Instinctive archers use no sighting apparatus. 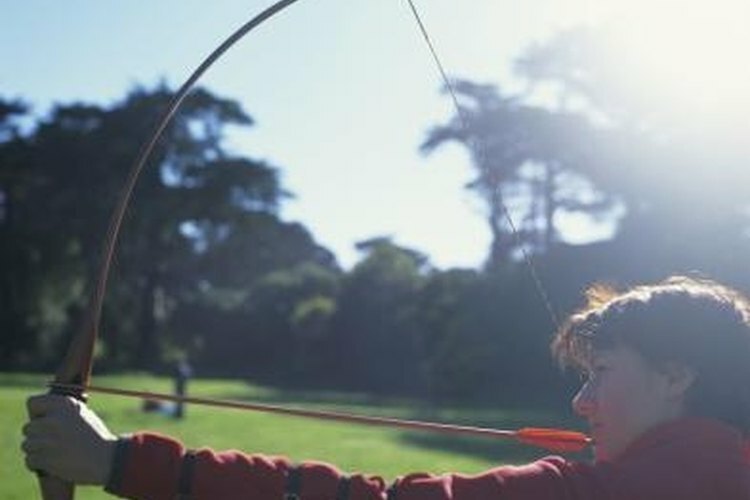 There are two basic schools of archery: instinctive shooting and aimed shooting. Instinctive shooters typically start with a longbow or a recurve, and never make a transition to a compound bow with its cams and pulleys. Aimed archers, on the other hand, tend to start with a compound bow fitted with some type of mechanical sight as an aim point. A compound shooter who wishes to try a more traditional form of archery often has difficulty learning how to aim a bow with no sight. Fortunately for those archers, a relatively new technique called "gap shooting" makes the transition easier. Set up your target 15 yards from the shooting position. Look at the target. Draw the bow and release the arrow in one fluid motion. Cant the bow to the right if you are right-handed, or to the left if you are left-handed. Touch your cheek with your drawing hand just as you release the arrow. Shoot another arrow. Look at the same point you aimed at before, not at the previous arrow. Note the position of the arrowhead in your peripheral vision relative to your aiming point just as you release the arrow. There should be a gap between the arrowhead and your aiming point on the target, with the arrowhead below the aiming point. Focus on the aiming point, not on the arrow. Continue to shoot. Don't worry too much about exactly where the arrows are hitting; concentrate on shooting exactly the same way every time so that the arrows group into the smallest cluster possible. Widen or narrow the gap between arrowhead and aiming point to move the point of impact once you are shooting consistently small groups. Always focus on a small point that you want to hit on the target. Move the arrowhead's position in your peripheral vision to make the arrows hit that point. Always be sure of what is behind your target area. Never shoot without a safe backstop.